This statement necklace has barely left my neck long enough for me to blog about it, so I hope it's still in the shops when you read this entry. You must, must, MUST get it if it is. No other piece of jewellery has received so much attention - from men and women alike (all favourable I hasten to add!). 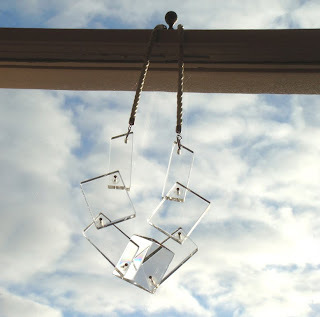 What I love about this Perspex number is that it reflects light and dazzles almost as much as gemstones would. It instantly dresses up whatever I'm wearing, adding a soupçon of cool. Plus, it's the perfect necklace for both day and night. It's been adorning my American Vintage sweater dress lately, although I'm picturing it on red velvet for an evening look (despite not owning anything in velvet!). But that's the thing about this piece, it makes such a statement that you want to wear it to its best advantage. Which means you'll find me - and it - standing under a whole lot of halogen lights! And the secret to my statement necklace? H&M... for just £9.99. But keep it under your hat - part of the pleasure of being a bargainista fashionista is wearing something so desirable that nobody would think it was high street in the first place. Just one word of warning - it is rather heavy! You know how women were in danger of injury when It bags became supersized? Well, I'm likely to get neck strain if I wear this for more than eight hours straight!